You probably thought this series was done, but no. 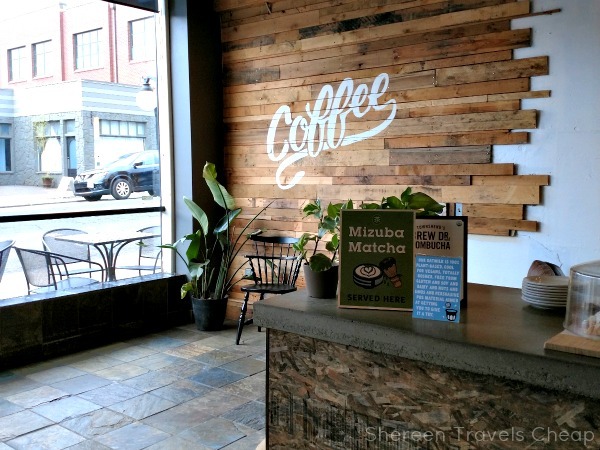 There are are still a bunch of coffee shops in Portland for me to get to. I got to two in the last two months (sorry, but my life has been super busy with no time to go out for coffee), but I also went to an awesome place in Anaheim while my friend and I were at Disney. I've spent a fair amount of time planning brunches and shuttling my mom to doctor appointments, so I was able to check out two shops in close proximity to each other that I've been wanting to try. This shop has a small, but inviting, storefront and I was instantly drawn to it. 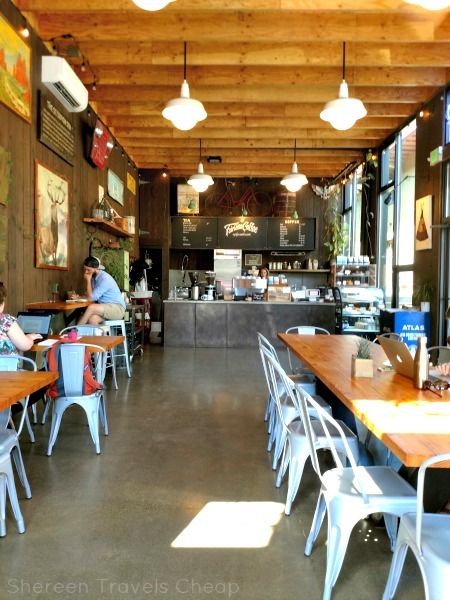 Fairlane is very Portland-y looking inside: industrial with warm woods. There's a cement floor, metal chairs and an outdoorsy theme throughout. 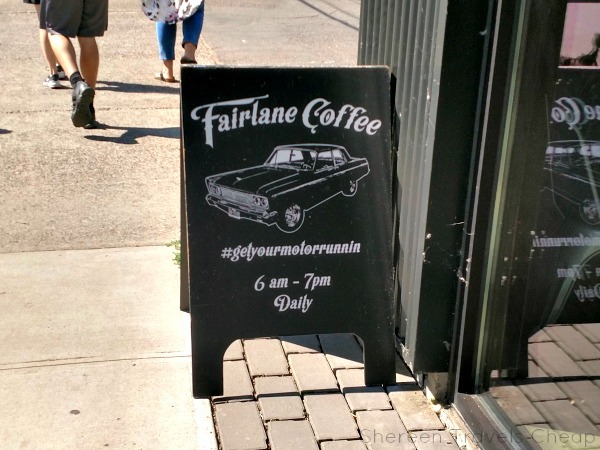 Imagine a lumberjack opened a coffee joint and you've got Fairlane. The case here is full of yummy looking pastries, plus there are a ton of awesome-sounding sandwiches on the menu as well, but I was just in the mood for a specialty coffee since we had just had breakfast across the street. 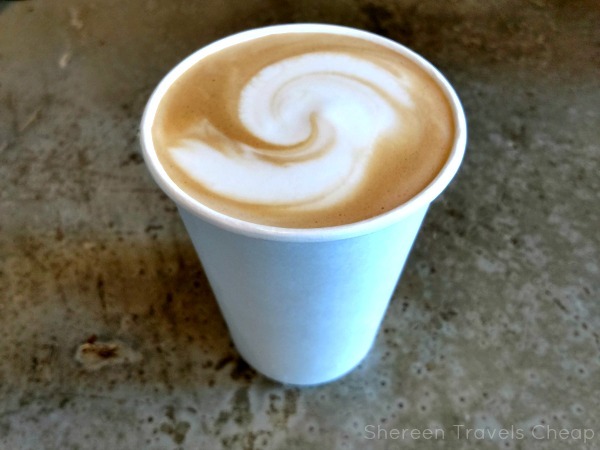 I ordered the Crater Lake ($4.25) which is essentially a vanilla, honey and lavender latte. If you love the soothing smell and subtle flavor of lavender, then this twist on an old favorite is going to be right up your alley. I'll definitely be going back when I am in the area again. Right around the corner fromFairlane is Kahveology (which is also across the street from a Starbucks, because Portland). It's bigger and a bit brighter with unfinished features, like this particle board counter and lapship wall. They brew with Oatly oat milk, which you know how I feel about (if you don't, I love it), but apparently, you have to pay an extra $.75 to get, and also serve Kombucha (which I hate with a passion). Eric was with me and we ordered an Americano ($3 -me) and a white chocolate mocha ($5.25 , because oat milk - him). I wasn't enamored by either drink. I felt the Americano, which I'm told is one of their most popular drinks, didn't have the full body I look for in a coffee. I also felt that the mocha was not that strong and wasn't worth the price. If I have the choice, I'll head around the corner instead. I've been following Creme & Sugar on Instagram (are you surprised?) and have been drooling over their unicorn lattes and milkshakes. I wasn't able to hit up the shop in Vegas for cotton candy burrito, so I found this place instead. While not exactly the same, the calories are probably up there. I found out they had all the Butterbeer options and drove 20 minutes to indulge. I mean, we were going to Universal the next day for Butterbeer at the Wizarding World, but why not pre-game a little bit? 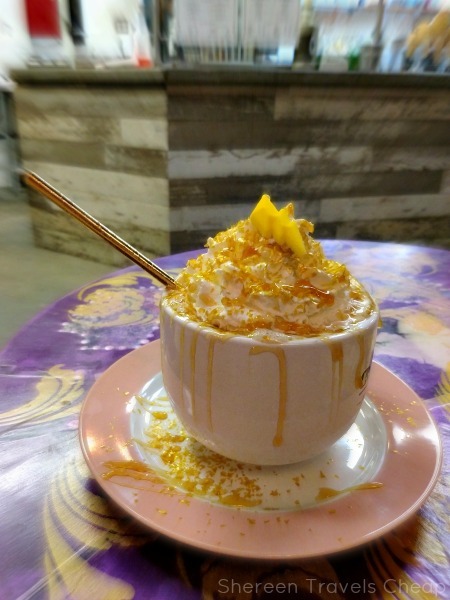 I was dead set on the Butter Latte ($7.25) piled with a mountain of whipped cream, butterscotch drizzle, gold sprinkles and a lightning bolt (as a nod to Harry himself). It was just as delicious as I expected and as big as my head. You don't get a choice of size. It's on the Epic Lattes menu. I forced Mel to order something ridiculous on me (or is it Riddikulus?) and she opted for the Butterbeer Float ($8), which also gives you the rest of the butterscotch soda that didn't fit in the glass. It also was covered in butterscotch drizzle, gold sprinkles, that adorable lightning bolt, but also gold Sixlets. She couldn't finish it and I wasn't surprised. Look at that thing! 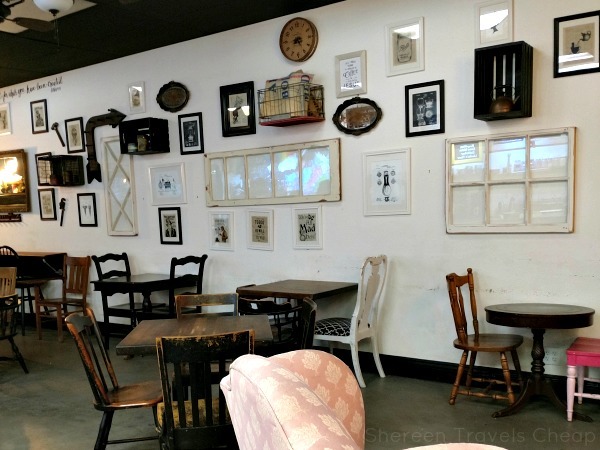 The shop itself is a mish-mash of amazing things: unicorns, rainbows, cake, ice cream, antiques. It's right next door to a pizza parlour and a nice family came in after they had eaten there and were asking us questions about it. They were a little surprised that we had never been there before and we had a nice chat about their yearly trips to Portland and what we were doing in Anaheim. 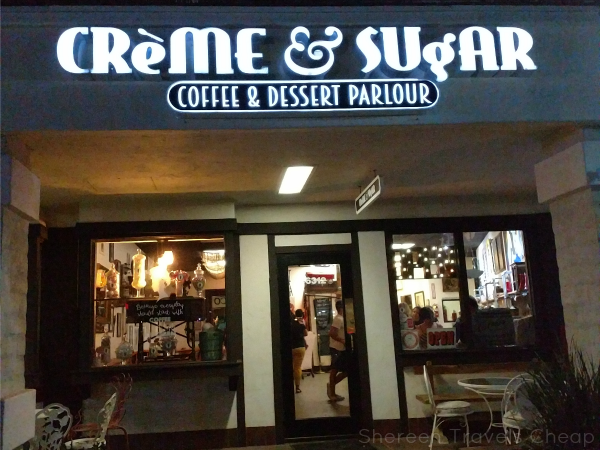 If you are dying for a good ice cream, float or coffee that's mostly sugar, this is the place for you. 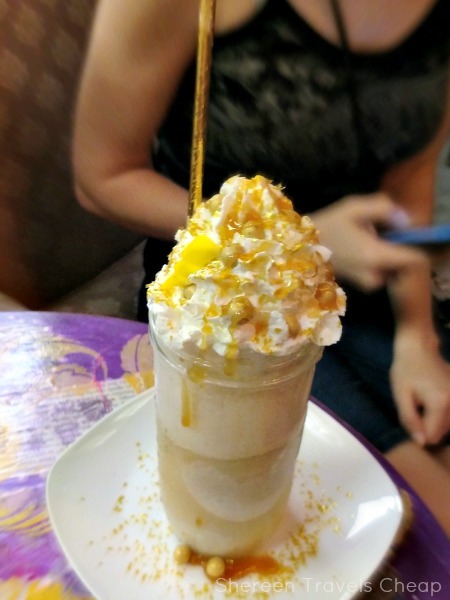 It rivaled my "official" Butterbeers at Universal. 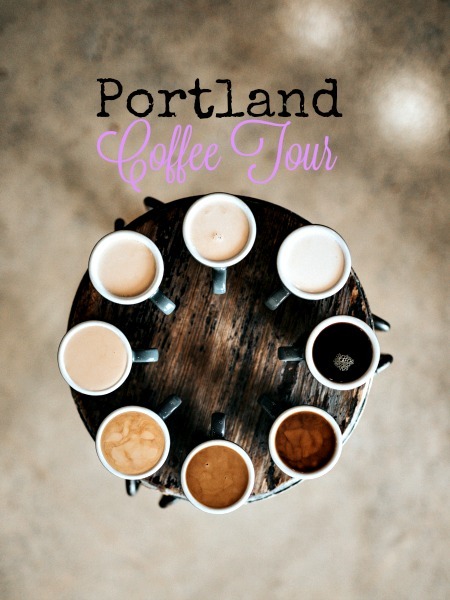 So, next month I'll try to bring you more coffee from actual Portland. I should have more time to get out and about and enjoy a cup (or 5) of locally-brewed Joe. 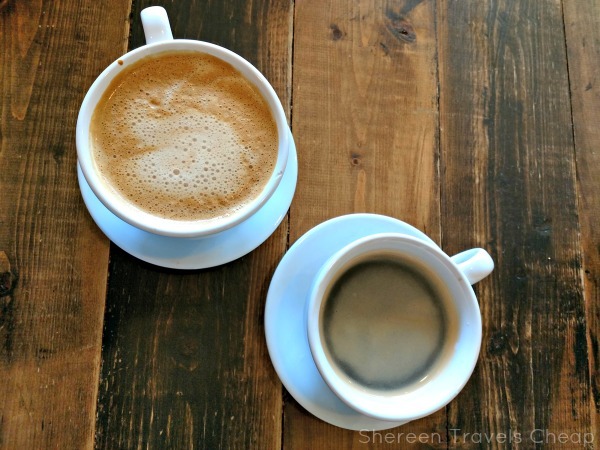 What are your favorite coffee shops where you live or from your travels?